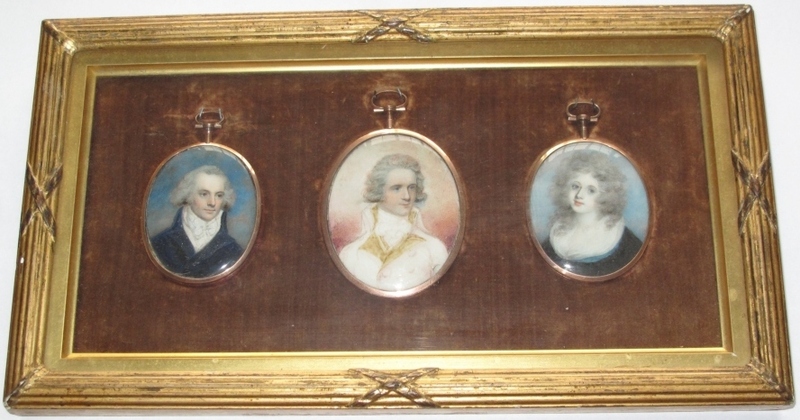 These three miniatures were almost certainly put together after the death in a naval battle of Capt Samuel, son of Sir Samuel and lady Elizabeth Marshall. By the inscription on the rear, the centre Miniature is Capt S E Marshall, jr. This Miniature was in 1826 undoubtedly owned by Lady Barrington, see the watercolour in the Maritime Museum, below. I have assumed that the two on either side of him are his parents. There is just a possibility that these two are Fitzwilliam and Edith-Mary Barrington, making the three to be her husband, her brother and herself, but it does not seem likely. An expert in clothing and styles of that period might be able to resolve this question.